Does your deck live up to its potential? Besides periodic cleaning and sealing, you may want to spruce things up a bit with additions that better suit your family’s outdoor needs and lifestyle. Lighting – If you find yourself out on the deck in the dark, you may want to explore some lighting options. There are a number of choices available for outdoor deck lighting, and many of them are solar powered so there’s no need for electrical wiring. There are even small lights that can be installed in stair risers to illuminate the steps. Seating – Built-in benches are one way increase available seating on your deck. Being stationary they aid in traffic control and are available even when other lawn furniture has been stored for the season. Planters – Bringing some plant life to your deck is a natural way to decorate with colorful pots and flowers. No floor space for pots? Consider installing flower boxes over the railings. Grill – If your deck is large enough to keep the heat and smoke away from the house, consider moving the grill onto the deck and include the grill master in the party. Some built-in end tables will keep tools and platters handy for the chef. 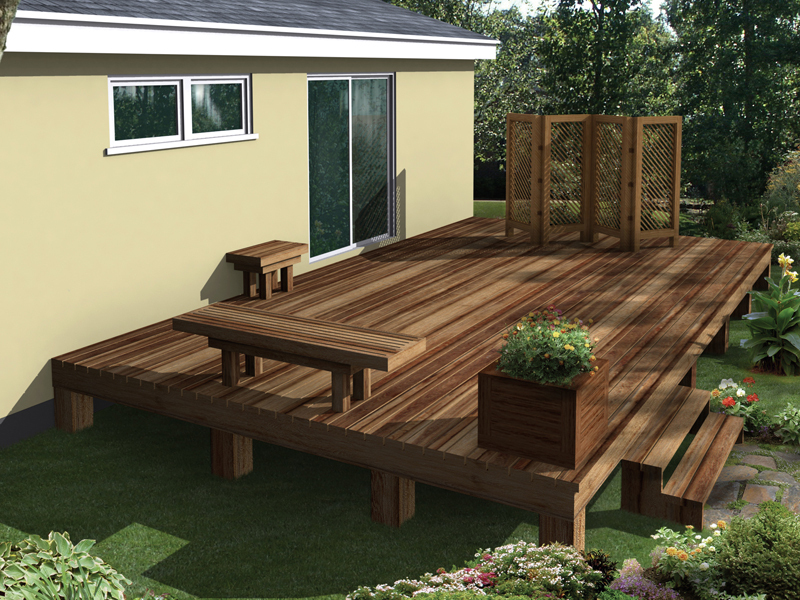 Shade – Too much sun can spoil an outdoor get-together, so you might wat explore adding some shade to your deck. Table umbrellas or awnings attached to the house may help. A pergola is similar to a trellis. With vining plants adding their shade, a pergola is an attractive and natural addition to your deck. There are even pergola kits available that may suit your needs. Storage – Many decks are built high enough to walk underneath and create a natural storage space for lawn furniture and pool accessories. If that space is not already enclosed, investigate adding some latticework to “hide” your treasures. When your imagination for improving your deck wanes a bit, definitely turn to the internet. Pinterest posts countless pictures and plans for your contemplation.